One of our most frequently asked questions is “How do payday loans affect my credit?”. It’s a hard question to answer because the answer depends entirely on how you manage paying off your payday loans. But, regardless, it’s an important question to ask and an even more important question to answer. After all, your credit can affect really big, important financial decisions, like buying a house, purchasing a new car, and financing other important purchases. If you’ve applied for a payday loan, you know that all you need to “qualify” for a payday loan is a bank account, a source of income, and some form of identification (i.e., a license). Payday lenders don’t run a credit check before approving loans. They don’t do much leg work at all to ensure a borrower can actually repay the loan. For many borrowers, this is appealing. However, this doesn’t mean that payday loans are a good option for those who are strapped for cash in a scary financial emergency. It also doesn’t mean that a payday loan won’t affect your credit. Since a payday lender won’t run your credit when getting approved for a loan, taking out a payday loan won’t necessarily affect your credit. Instead, payday loan companies use your income verification as their credit check. 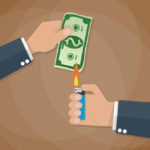 Although payday loan activity doesn’t generally show up on credit reports from the three national bureaus (Equifax, Experian, Trans Union), the Consumer Financial Protection Bureau (CFPB) warns that there are “specialty credit reporting agencies that collect some of your payday loan history” and that it’s possible that lenders may have access to this information. Unfortunately, for most payday loan borrowers, however, payday loans do wind up affecting their credit and in very harmful ways … not because they took out a payday loan, but because that one payday loan turned into an unmanageable cycle of loans. As long as you continue to pay the additional fees you incur, rolling over payday loans won’t affect your credit score, either. But if, like many people, you miss a payment or become so deep in debt that you’re unable to pay off the loan(s), your credit score can be affected. 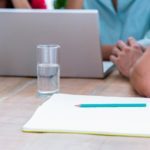 The fact that you applied for a payday loan will not necessarily affect your credit, but there are several ways a payday loan can harm your credit. 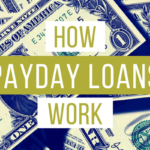 How you handle the payday loan and whether or not you stay on track with payments and fees will determine whether or not a payday loan affects your credit. A payday loan requires that you provide a check for the total amount of the payday loan plus additional fees. The check is held until your payday loan is due. At that time, the check can be cashed by the lender. If there aren’t funds in your bank account to cover the total amount of the check, you’ll end up with a bounced check. Bounced checks don’t directly affect your credit. However, if you bounce a check and do not repay it, the bank can have your account sent to collections. The collection agency can then report this to the credit bureaus, which will negatively affect your credit score. There’s one other common way a payday loan can negatively impact your credit. If you don’t pay your loan back in a timely manner, the lender can choose to send your debt to collections. At this point, the collection agency can report this unpaid debt to the national credit bureaus, thereby negatively affecting your credit score. If this debt ends up on your credit report, it can hurt your credit score for up to seven years, even if you pay the collections amount or the judgement against you. In the event that the post-dated check you provided to the payday lender does not clear the bank and you default on the loan, this also often results in the debt being sold to a collection agency and being reported to each of the three credit bureaus. According to this article by National Debt Relief, although payday loan debt might seem different than standard personal loan or credit card debt, they work the same way if you’re unable to pay back the money you borrowed. The debt is sent to collections and it ends up negatively affecting your credit. There is the possibility that a payday lender or a collection agency could sue you to collect unpaid loans and fees. If you weren’t to appear in court or were to lose the case or not pay the judgement, this can show up on your credit report and impact your credit score for up to 7 years. While taking out a payday loan won’t necessarily affect your credit negatively, the repercussions of payday loan debt can. With 80% of payday loans being either rolled over or renewed, it’s apparent that the payday loan debt trap is very real. For many, it leads to unmanageable monthly payments and taking out payday loan after payday loan to cover the increasing interest and fees from previous loans. This cycle, unfortunately, leads people into financial situations where they aren’t able to pay off their debt, and, this results in negative repercussions on your credit. 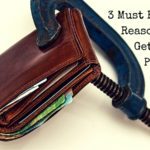 So, how do you avoid payday loans affecting your credit? Stay away. Struggling with a cash flow gap and considering payday loan? Read these 4 ways to cope when you’re short on cash without turning to payday loans. If you’ve taken out a payday loan (or multiple loans) and feel stuck, we can help. Contact us to learn how payday loan consolidation can help you get out of the payday loan debt trap faster.